Like Paul Powell's illicit shoebox fortune and Otto Kerner's tax evasion, the case of Orville E. Hodge is often cited as a major one in the seemingly perpetual financial scandals carried out by Illinois public officials. Born in Anderson, Illinois, in October of 1904, Hodge moved with his family to Granite City when he was four years old. In his adulthood, he would inherit his father's company, the Hodge Agency, and specialize in realty, insurance, and construction. After serving in the Illinois house of representatives, he was elected as the state's auditor of public accounts. Known as a jovial figure who made friends easily, Hodge was considered a rising star of the Republican Party who had the governor's office in his future. Starting the auditor role in 1953, Hodge initially met with success. He negotiated a budget for his office that brought an additional $2.5 million to the auditor's office over the previous biennium. In 1955, however, Hodge came before the Illinois legislature with hat in hand. He had spent enough of the budget that it would run out before the end of the term. The legislators approved a $525,000 emergency appropriation to bail him out, trusting that Hodge was a capable official. The next year, an unraveled financial scheme proved just how wrong this assumption was. Investigative reporter George Thiem, writing for the Chicago Daily News, pursued a tip that Hodge was mismanaging his accounts. Thiem uncovered 15 instances where Hodge had written state warrants, or checks, totaling $108,000 to people or firms. None of those named on the checks ever received a dime. The revelation would earn Thiem a Pulitzer Prize and Hodge a stay in prison. State and federal authorities began investigating his accounts in July of 1956. The investigation uncovered a chronic pattern of embezzlement that had started in May of 1955. In addition to writing false warrants and state contracts, Hodge had falsified expense reports and set up dummy employees to receive kickbacks from their salaries. Although investigators initially found irregularities amounting to $536,226, the figure began to steadily climb as more and more misconduct was brought to light. Governor William G. Stratton, who at first ordered Hodge to double his $50,000 bond, now urged the auditor to resign. Hodge did so, with Stratton inviting retired University of Illinois comptroller Lloyd Morey to take over the position for the six months remaining in Hodge's term. Federal investigators soon ordered the arrests of Hodge as well as Edward A. Epping, his former office manager, and Edward A. Hintz, the resigned president of Chicago's Southmoor Bank and Trust. Epping was accused of taking six state checks to the bank, where Hintz cashed them. Hodge was charged with using the assets to purchase a number of luxury items including two private airplanes, four luxury cars, a resort hotel suite in Florida, a home on Lake Springfield, and other real estate and stocks. The total amount of stolen money was uncertain, and indeed varied among reports; most put the figure in the area of $1.5 million while others said it was considerable higher, citing the specific sum of $2,500,008. "Where do they get that $2.5 million?" Hodge himself would later ask in a prison interview. "I was sent here for $650,000 and they're getting that back." One calculation suggested that Hodge had embezzled more than $1 million by depositing phony state warrants in federally insured banks, misappropriated $500,000 by liquidating the funds of closed banks, and acquired another $1 million through illegal expense accounts, expenditures, and fraudulent contracts. Hodge was charged with both state and federal crimes, since the activity had involved the misappropriation of bank loans insured by the United States. Hodge wrote a 176-page "clean breast" statement, admitting to the wrongdoing and saying he had misappropriated funds both to maintain a high standard of living and to further his aspirations to be governor. He admitted that Epping and Hintz had been involved in the scheme, but denied that they had benefited personally. Hodge also returned $528,000 to the state shortly after the wrongdoing was discovered and vowed to give up his assets to aid the restitution. In August, just one month after the illegal activity came to light, Hodge pleaded guilty to federal charges of embezzlement, forgery, running a confidence game, and conspiracy to defraud the state. He was sentenced to 20 years in prison, with the stipulation that the term would be cut in half if he made good on a $816,427 restitution. Later in the same month, Hodge was sentenced on state charges that he had embezzled $637,000. The prosecutor, a fellow Republican named George Coutrakon, wanted to make an example out of Hodge by sentencing him to 42 to 45 years in prison. However, Hodge was ultimately ordered to serve 12 to 15 years in prison, concurrent to the federal sentence. Soon after, Hintz was sentenced to three years in federal prison. In September of 1956, Epping was ordered to serve four to five years behind bars. A policeman, William Lydon, was found guilty of conspiring with Hodge to get false bids on remodeling contracts to the tune of $88,787; a jury convicted him of conspiracy in November of 1957 and fined him $2,000. 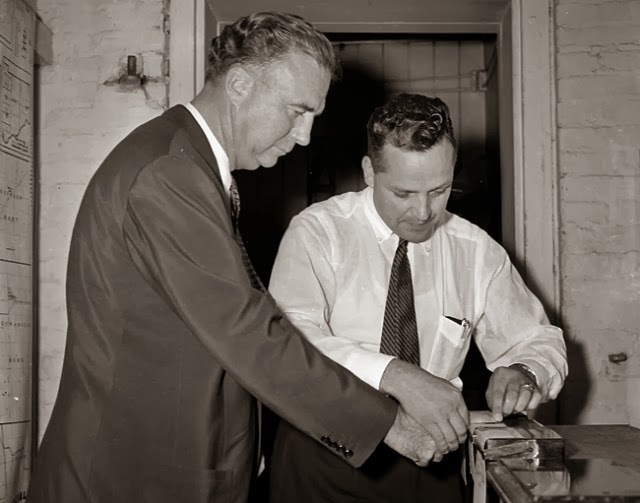 The final conviction related to Hodge came in January of 1958, when Epping was further convicted on federal charges of forgery, running a confidence game, and embezzlement. He was sentenced the next month to another one to 10 years behind bars. The court confirmed that Hodge had paid his restitution in 1957, meeting the requirement to reduce the federal sentence. Morey would use his brief time in office to develop a reform program, while his successor Elbert S. Smith continued this reorganization and efforts to get back the money Hodge had stolen. The state would ultimately recover more than $2 million. Hodge served six-and-a-half years of the remaining sentence before Governor Otto Kerner reduced his sentence to 10 years so he would be eligible for parole. He was released at the end of January in 1963. Nearly broke, Hodge returned to his hometown of Granite City to start working in his sister's hardware store. He later began working as a used car salesman and real estate agent. Hodge died in December of 1986.